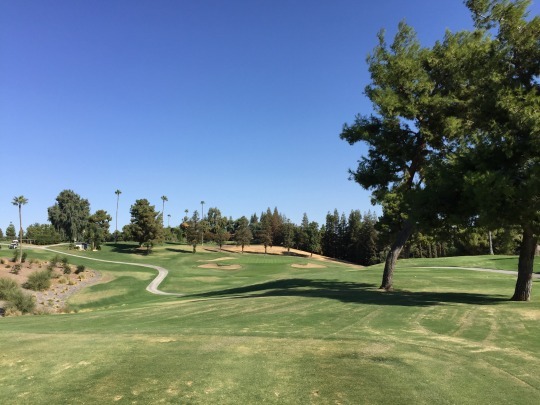 Last Thursday, I made my way up to Bakersfield for another SCGA member outing. As you might expect, I made a full day of it and everything worked out well. We had an 8:30 shotgun start, but it wasn’t a very big SCGA group. 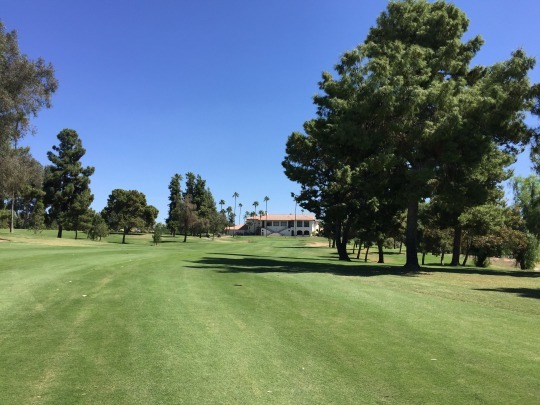 My foursome started on the first hole and we were finished in about four hours, so it was an ideal pace. 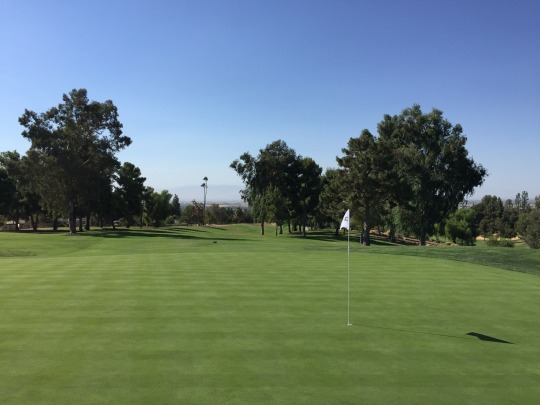 Before our round, my friend and I quickly played the 18-hole putting course that sits out in front of the big clubhouse. 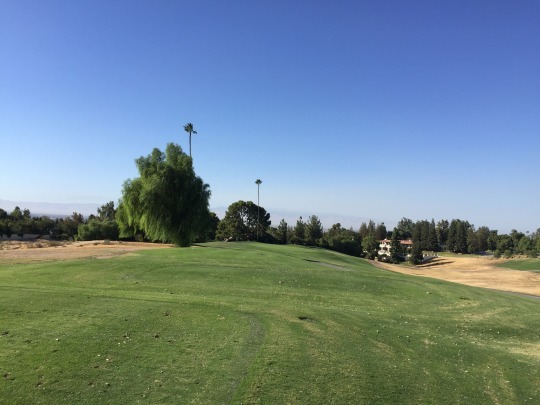 It’s a fun and rather difficult putting course built on a little hillside. The grass was fluffy and not easy to putt on, so that added some challenge. We still had fun on it, though. 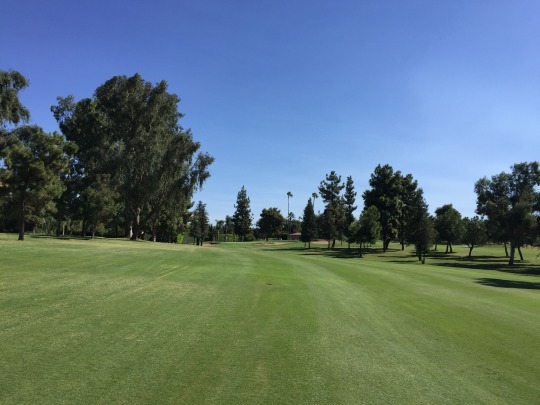 The course at Bakersfield Country Club was opened in the 1950s and the traditional layout was designed by William P. Bell, who has been behind so many classic old courses throughout Southern California. 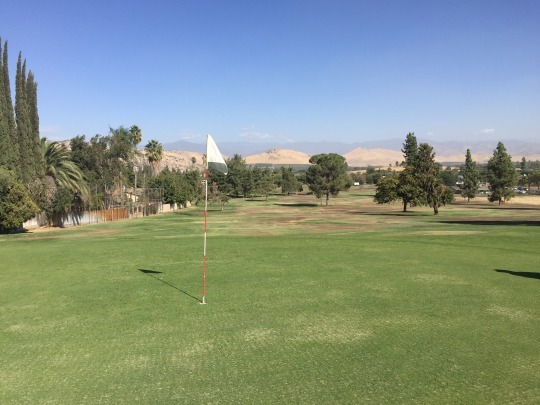 Unlike many of the older tracks throughout the Central Valley, Bakersfield CC was built on a piece of land that actually had some natural hills and undulation. That adds some character. There are some spots with nice views of the nearby mountains, as well. 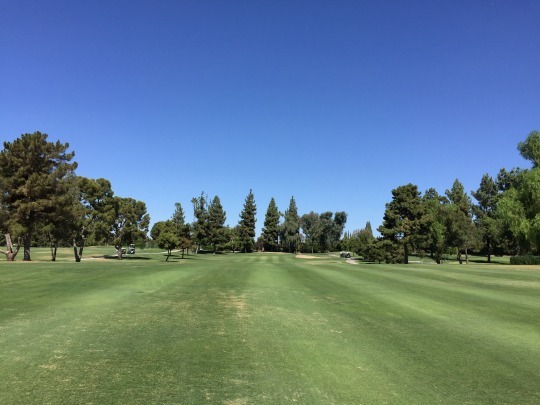 There are some doglegs, plenty of mature trees and those natural undulations in play to keep it from feeling too basic. That said, it is a pretty traditional style of course that represents the era when it was built. 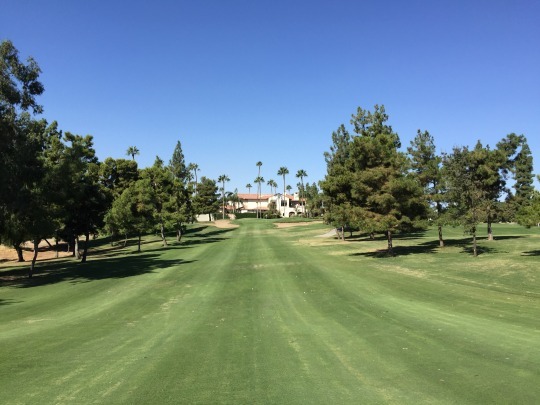 And that’s a good thing because the history and some of that classic charm help provide a fairly enjoyable golf experience. I wondered if they switched around the routing at some point because one of the signature holes was the 12th. 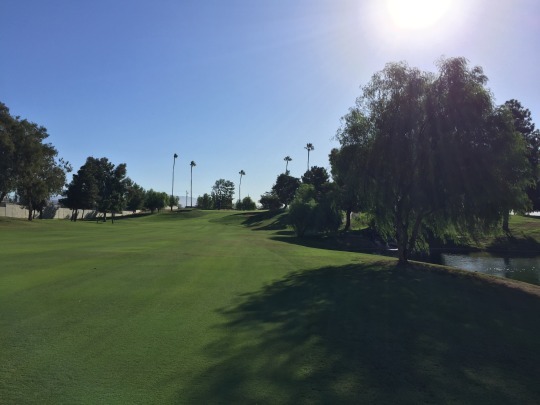 It’s a big dogleg right around a creek that feeds into a lake next to the green. 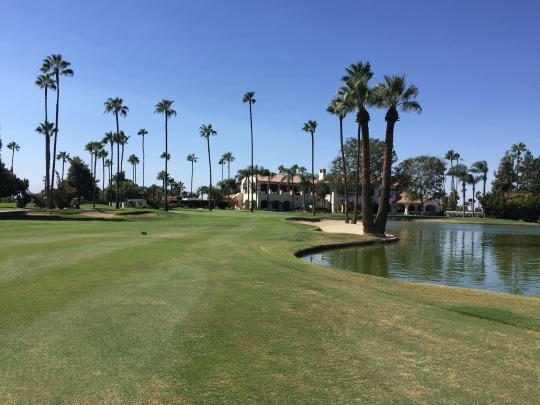 With some palm trees, water features and the clubhouse in the background, it seems like it is meant to be the finishing hole. 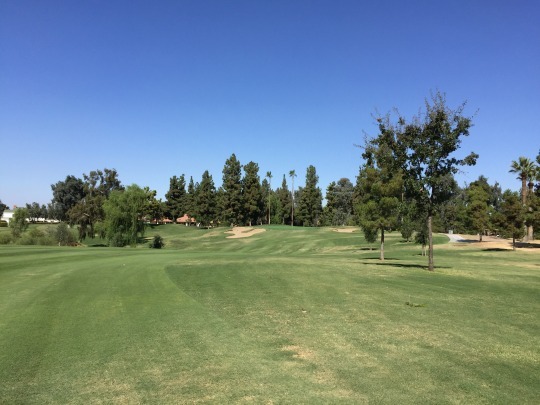 The current 9th and 18th holes are also nice, too, but don’t have quite the same signature approach look. 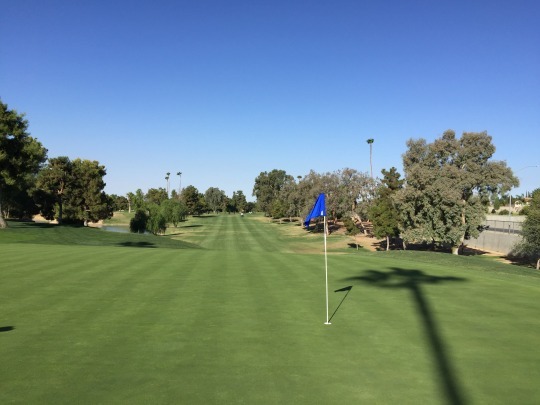 The conditions were pretty good overall, highlighted by the greens. They were very soft/receptive, and rolling well at medium speeds. There are some very deceptive reads here. The greens don’t look all that severe, but some downhill putts were tough to stop and we had trouble trying to figure out what the prevailing breaks were. The tee boxes were nice. 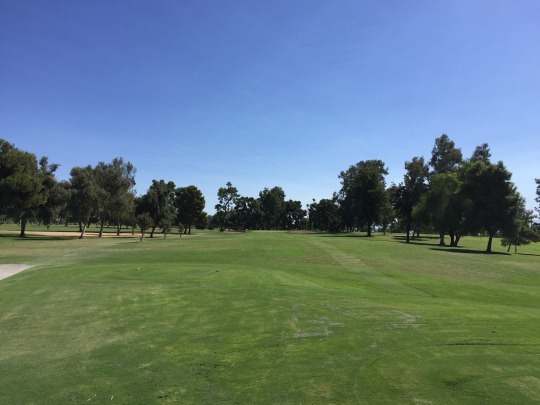 The fairways were generally quite lush, but soft and maybe overly fluffy. Drives would often stick and sometimes even back up a foot or two, so they provided no roll-out at all but nice lies to hit from. There were some overly wet areas here and there, too. 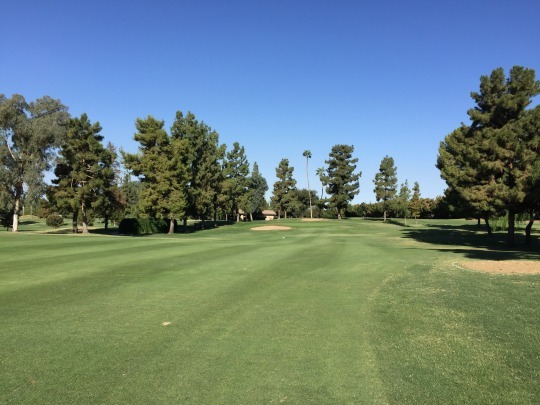 The rough was not much of a factor along the fairways, but was generally decent and got nicer around the greens. The bunkers were good, not great. 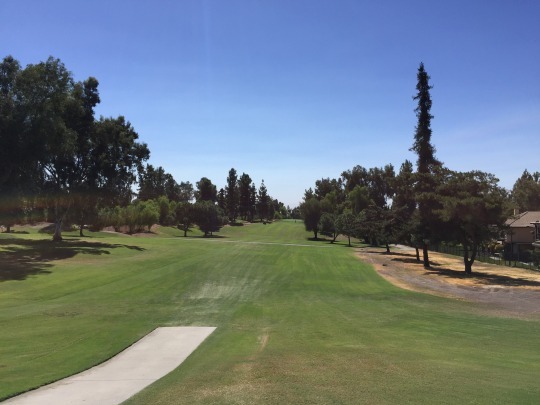 Is Bakersfield Country Club one of Southern California’s must-play old school private courses? No, it’s not on that kind of level. However, if you can get out there, guest rates are very reasonable and it’s a good overall experience. 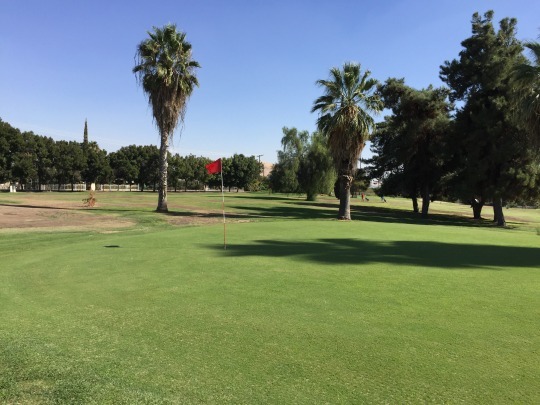 Conditions are clearly kept well above average, the amenities are nice enough and it seems like a friendly club atmosphere befitting the blue collar spirit of Bakersfield. 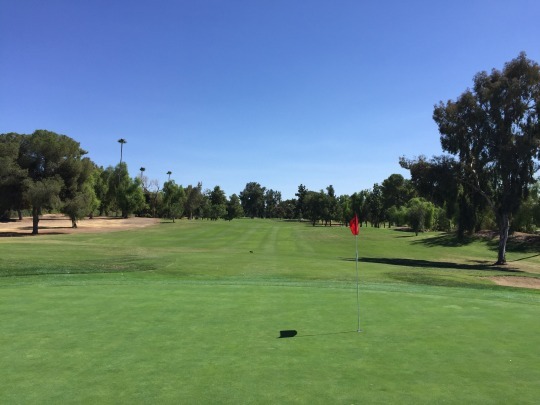 Not too long ago on my last visit to the Central Valley, I attempted to play a trio of short courses that were kind of “out of the way.” Things went smoothly at Exeter, and then I made Lindsay work. 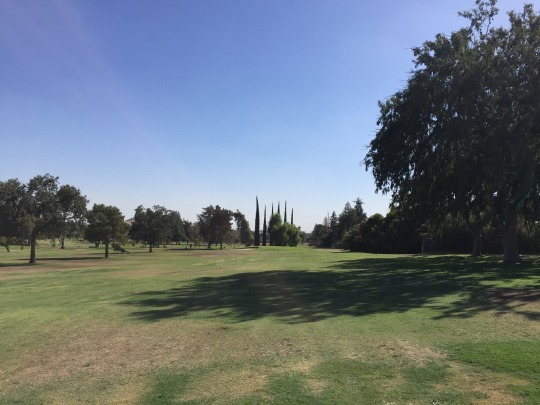 It was all kind of in vein, though, when I showed up to Porterville Golf Course and it was completely shut down for the day with no way for me to play. 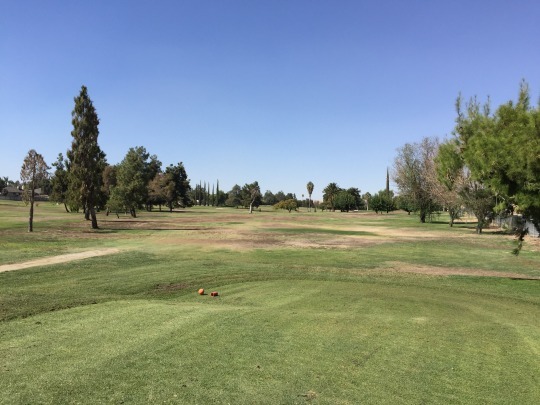 I knew after that Porterville Golf Course would be my stop after the Bakersfield SCGA outing. This time, we called ahead and the course was slated to be open all afternoon. It’s about an hour drive from Bakersfield to here, so we wanted to play it safe. It was not busy at all out there when we arrived. Thankfully, it was also cheap. 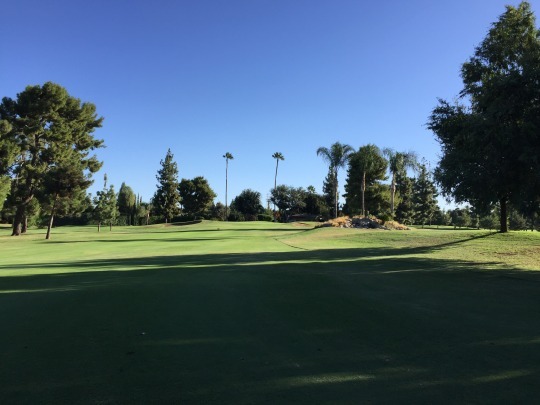 The green fee for nine holes was just $5 and a cart for both of us was $9 total, so $9.50 each took some sting out of what we expected to be a pretty forgettable experience. We zipped around the course with nobody in front of us, finishing in a little over an hour. As expected, it was a pretty lackluster course with rather terrible conditions. 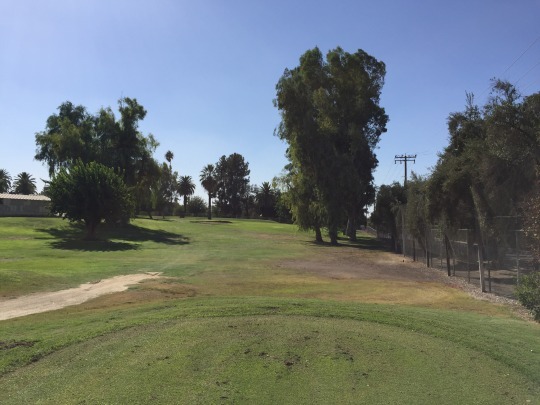 Actually, if the place were well-kept, it would be a pretty serviceable course. It’s not a terrible layout by any means. 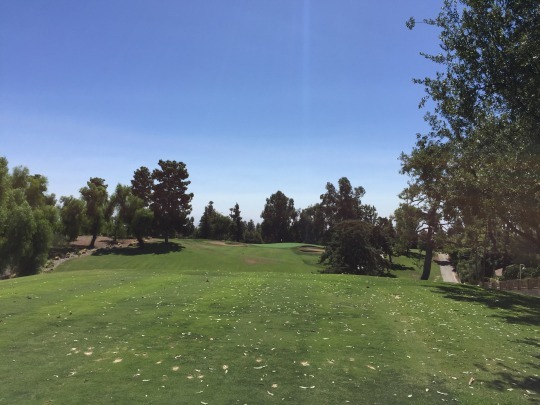 It’s a par-35, topping out around 2,800 yards (depending on front/back tee sets you play). 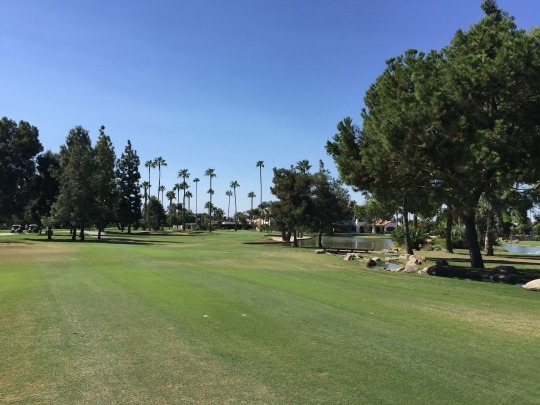 There is just one short, but very tricky par-5. Otherwise, it’s a pretty average mix of lengths for a regulation course. Unfortunately, the conditions were pretty bad. Everything was very dried out and brown. There were plenty of bare spots mixed with dead patches of grass. 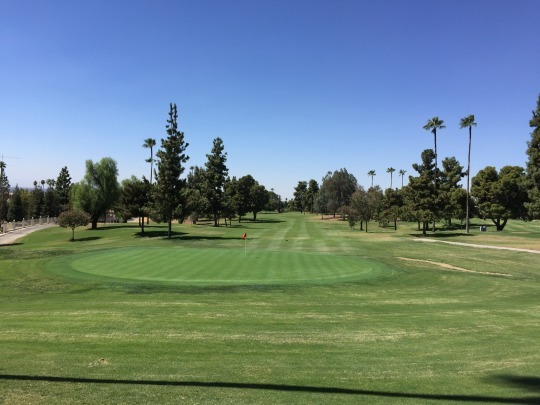 Most of the scattered green spots were generally right around the sprinklers or just sections of weeds growing in. The ground itself was pretty lumpy and beat up, so even if they were to grow in a nice layer of new grass the surface underneath would still be quite uneven. In other words, I assume Porterville at its best is probably in mediocre condition. We then caught it at the worst time of year at the end of a very hot summer in the Central Valley. The greens also had major issues. They had just punched and sanded them, but you could tell the grass that was there was very inconsistent with multiple types coming in (some weeds, too). The greens were very slow and bumpy amidst the maintenance. 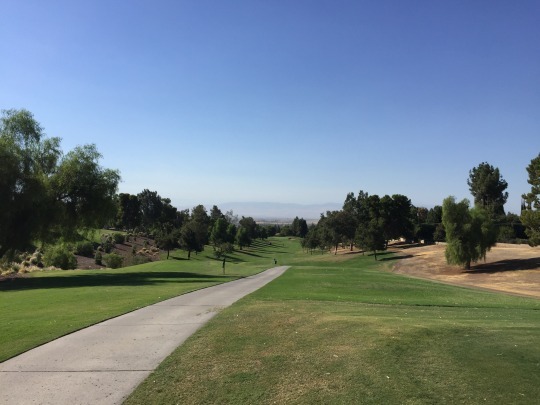 I didn’t expect much from Porterville and it delivered on my low expectations. That said, I am very happy to be done with it. It was a big one to check off my list because it was the last public course on my map in this region. 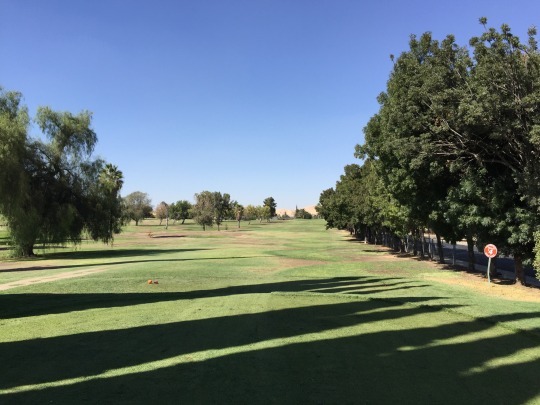 After Porterville, we squeezed in a round at Porterville’s other course, River Island Country Club. It was one I had played before (read the review here) and enjoyed quite a lot. It’s one of the Central Valley’s hidden gems, if you ask me. My friend had not played it yet, so I didn’t mind going there again so he could check it off his own list. I am not going to review it again here, so check out my old review for thoughts and pictures. It was in pretty nice shape on this most recent visit, so it worked out well to stop there while in the middle of nowhere—Porterville, I mean.